It's been a while since I put up a post on food... so here's something that is one of my go-to meals. I love pizza, and seriously, who doesn't? But eating the wheat in the crust of a standard pizza just isn't worth it to me, and I was delighted when I discovered that there is something even more delicious than pizza. 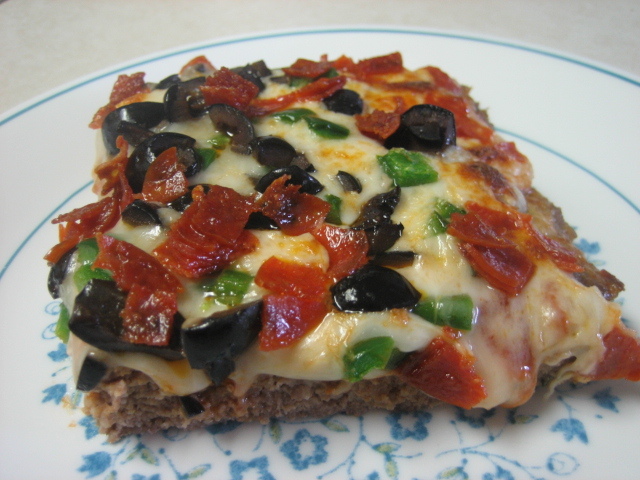 It's called meatza, and it's a pizza with the crust made out of ground beef instead of flour, making it suitable for evolutionary nutrition, paleo, or low carb. (1) Preheat the oven to 450 degrees F.
(2) Take your two pounds of ground beef and use your hands to mix it with the 2 beaten eggs. The eggs will help the ground beef stick together. (3) Mix in the pizza seasonings with the ground beef and egg. (5) Bake this in the oven for 10 minutes. (6) Slice and lightly cook onions, peppers, and garlic. Chop the olives, avocado. Cook the bacon and cut it in to pieces. Shred your cheese of choice. (7) When your crust comes out of the oven spread 1) the pizza sauce, 2) your shredded cheese, 3) all of your toppings, 4) maybe some more cheese on top. My meatza, prepped for step 8. (8) Put it under the broiler for about 5 minutes. It finishes really fast and may take even less. (9) Slice it up and enjoy! The meatza was so good my friends and I ate it before I had a chance to take a picture of the finished product. I like this dish a lot and because it's so quick, I make it fairly often. I love this food. Really great taste it has. Here you provide nice recipe and it could be made easily with this recipe. What a great idea to use ground beef as the crust! Thanks!